In the first edition of his famous Lives of the artists, Giorgio Vasari ascribed the invention of engraving to Mantegna. While this is an exaggeration not to be taken at face value (Vasari revised his opinion in the second edition of Lives published in 1568, bestowing the accolade on the Florentine goldsmith Maso Finiguerra instead), Mantegna was, nevertheless, the first painter of major significance to devote attention to printmaking, and his engravings are among the most impressive prints made in the 15th century. None of Mantegna’s prints is signed or dated, and this situation – abetted by the scarcity of documentary evidence concerning the circumstances of their production or, indeed, of Mantegna’s training and activity as an engraver – has provoked ongoing debate about their authorship. In the 19th century the number of prints ascribed to Mantegna amounted to more than 20. For most of the 20th century, only seven were identified as being by his own hand, with many designated ‘School of Mantegna’. The seven engravings – which remain the traditionally accepted corpus of autograph works – are thought to have been completed between the mid 1460s and mid 1480s. Mantegna was born in the village of Isola di Carturo, north of Padua, and by 1442 was apprenticed to the painter Francesco Squarcione. In the university town of Padua in the 1440s his fascination for classical civilisation was incubated by the circle of scholars with whom he associated, and he became an amateur archaeologist. His interest in antiquity was pursued further at the learned court of Mantua, where he entered the service of Ludovico Gonzaga as court painter in 1460. The revival of the artistic ideals of antiquity that defines the Italian Renaissance is nowhere better illustrated than in Mantegna’s work, and it was due in large part to his engravings – which Dürer copied during his first trip to Venice – that the classicising style of the Renaissance spread throughout Europe. 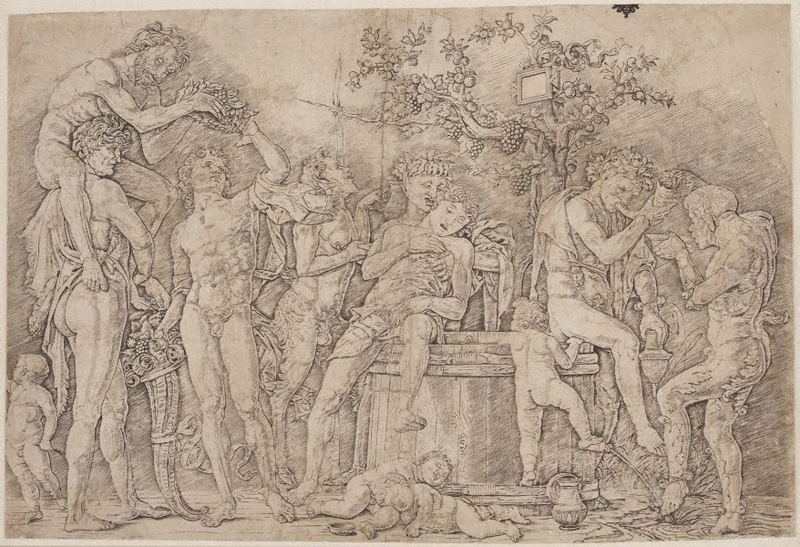 In Bacchanal with a wine vat, the first of his four mythological plates, Mantegna consciously emulated the appearance of antique sculptural reliefs. The subject matter can be traced to a Roman sarcophagus in the Villa Medici in Rome depicting the Judgement of Paris, but rather than faithfully translate the scene from ancient marble to modern engraving, Mantegna reinterpreted the original source so as to invent a new composition. With its flagrant pagan imagery and refined workmanship, engravings like this attracted the admiration of connoisseurs and helped encourage the demand for fine artistic prints, a category for which there was no precedent in a market dominated by popular devotional images. 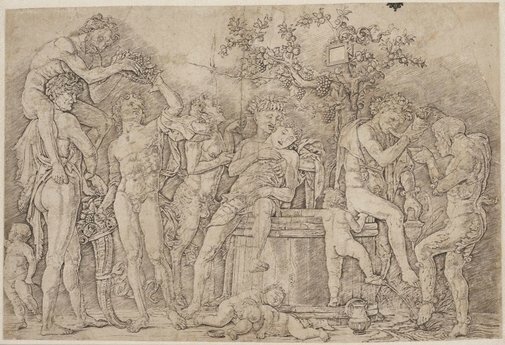 The scene of drunken revelry relates thematically to Bacchanal with Silenus (early 1470s), which is often regarded as its pendant engraving. Bacchus, the god of wine, is classically posed and holds a cornucopia filled with grapes while being crowned with a wreath. Other pagan creatures display the effects of wine by their lasciviousness or lassitude. A sober putto lifts his foot onto the spouting tap in order to peer into the barrel, while nearby his two drunken companions lie sprawled on the ground. To the right a faun dances in a puddle of wine. Mantegna modelled the hard clear forms of the composition in the same way as his pen and ink drawings, with restrained parallel hatching laid down in diagonal masses. As part of his experimentation with the novel medium of engraving he also used the technique of drypoint to create deeper tonal effects. But the delicate drypoint, which imparts a dark velvety texture to the printed line, wears down quickly. It exists in exceedingly rare early impressions of this print but it had already disappeared when the Gallery’s example was printed. Richard Beresford, Look , 'Mantegna to Piranesi Italian Old Master Prints from the Collection', pg. 14-15, Heidelberg, Jun 1998, p 14, illus p 15. Renée Free, AGNSW Collections , 'The Western Heritage, Renaissance to Twentieth Century', pp 108-172, Sydney, 1994, col illus p 112. Bruce James, Art Gallery of New South Wales handbook , 'Western Collection: Works on Paper', pp 78-92, Sydney, 1999, illus p 79. Art Gallery of New South Wales picturebook , Sydney, 1972, col illus p 6. Prints & drawings Europe 1500-1900 , Sydney, 2014, pp 20, col illus p 21.